Dr. Samuel A Hoisington, MD is a Doctor primarily located in Hawthorne, NY, with another office in Sleepy Hollow, NY. He has 28 years of experience. His specialties include Orthopaedic Surgery. He speaks English. Dr. Hoisington has received 1 award. The overall average patient rating of Dr. Samuel A Hoisington is Great. Dr. Samuel A Hoisington has been rated by 7 patients. From those 7 patients 2 of those left a comment along with their rating. The overall rating for Dr. Samuel A Hoisington is 4.0 of 5.0 stars. I went to see him because I had fallen and thought I had dislocated my shoulder. It turns out that I broke my arm (high up). He admitted me to Phelps ASAP and scheduled surgery for the next day. He explained what options he would have. He was so kind and caring and put me at ease right away. Surgery took 3 hours. He came to my room, explained what he did and said that I would be just fine. I believe him. Thanks Dr. H.!! Dr. Hoisington removed an infected rheumatoid nodule from under the ball of my foot. He was very professional, very competent, very helpful discussing all of the options with me and helping me even to obtain second opinions. I highly recommend him as a surgeon. Take a minute to learn about Dr. Samuel A Hoisington, MD - Orthopaedic Surgery in Hawthorne, NY, in this video. Dr. Samuel A Hoisington is similar to the following 4 Doctors near Hawthorne, NY. 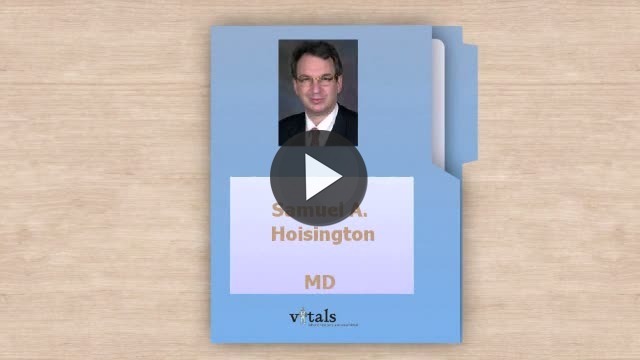 Have you had a recent visit with Dr. Samuel A Hoisington? Select a star to let us know how it was.